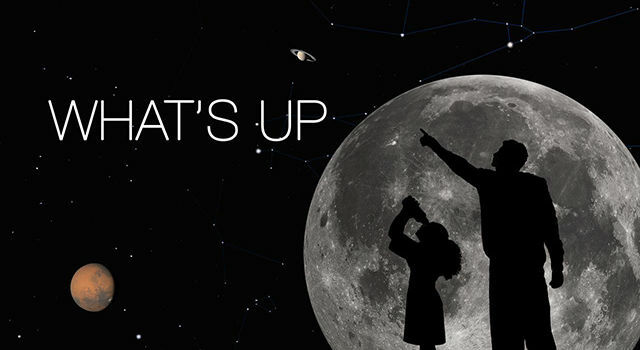 Research scientist Dr. Alberto Behar of NASA's Jet Propulsion Laboratory took in the "show" at the moulin this summer. But unlike Paris' famous Moulin Rouge, this moulin had no singers or colorful dancers adorned in feathers, rhinestones and sequins. Rather, the star of this moulin was Mother Nature herself, presenting a dazzling display of moving water and ice. A moulin is a narrow, tubular shaft in a glacier that provides a pathway for water to travel from the glacier's surface to its bottom. 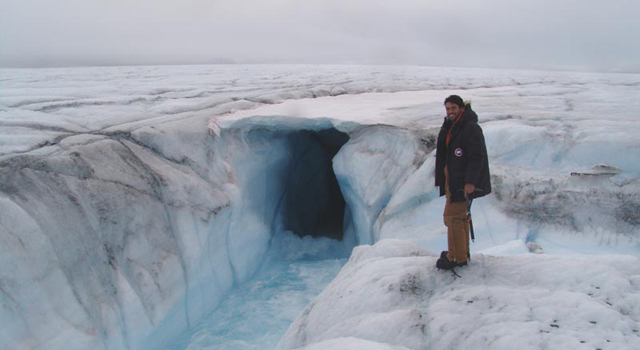 Behar and co-investigator Dr. Konrad Steffen of the University of Colorado, Boulder, led an expedition to send a JPL-built probe down into these glacial chutes in the remote and isolated Pakisoq region of the West Greenland Ice Sheet. That dynamic area of Earth's northern polar region is not well understood and is responding rapidly to climate change. Previous NASA measurements there using global positioning system data show the ice there moves an average of about 20 centimeters (8 inches) a day, accelerating to about 35 centimeters (14 inches) a day during the summer melt. The scientists set out to see if these moulins, or pathways, within and beneath these mountains of ice can shed new light on how glacial water flows from the ice sheet to the sea. "How water is distributed within a glacier and the rate at which it permeates through to a glacier's bottom affects the glacier's ability to store water, its pressure, and the speed at which a glacier moves," said Behar. "Scientists have long known that ponds of melted ice on the surfaces of glaciers and the moulins they create allow glaciers to flow faster. Our study -- the first of its kind in this region -- we hope will provide a better understanding of the factors at work here." In glaciological terms, moulins (French for "mill") are essentially vertical "rivers" that serve as a glacier's internal plumbing system, carrying water out of the glacier from melt water lakes on the surface. They can be hundreds of meters deep and up to 10 meters (33 feet) wide. The melt water lakes are typically found in the undulations of the ice sheet all around Greenland between 500 and 1,500 meters (1,640 to 4,920 feet) above sea level. Occasionally, the lower end of a moulin may be exposed in the face of a glacier. In Greenland, the surface of the ice sheet moves at varying speeds, on both seasonal and shorter-term time scales. Seasonally, glacial water penetrates to the glacier bed through significant thicknesses of cold ice. Occasionally, however, there are periods when water flows rapidly into glacial drainage systems. 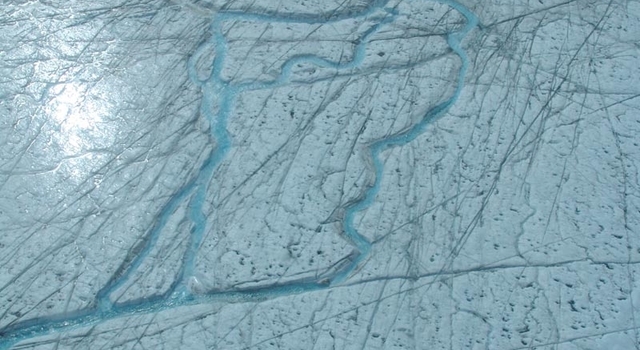 For example, early in the melt season, new drainage connections are established between glacial surfaces and their beds, resulting in sudden new flows of water out of the glaciers. In the middle of the melt season, surface melting resumes after periods of cold weather, which can partially close sub-glacial channels. The moulin probe Behar and his fellow scientists used evolved from a proven design tested extensively in the lab and the field during three Antarctic field research investigations. Then known as the Antarctic Ice Borehole Probe, it studied ice streams in West Antarctica, the Amery ice shelf in East Antarctica and the Rutford ice stream in West Antarctica. The current version of the probe retains the ruggedness of the previous version but is modified specifically to explore the moulin environment. It consists of two high-resolution charge-coupled device cameras (a side-viewing digital camera and a downward-viewing video camera), lights, associated electronics and an inclinometer that measures the tilt of the moulin chute. Images are sent in real time through a tether one kilometer long (about 3,300 feet) to a receiving station at the surface. The station has a video display, computer and digital tape recording devices. 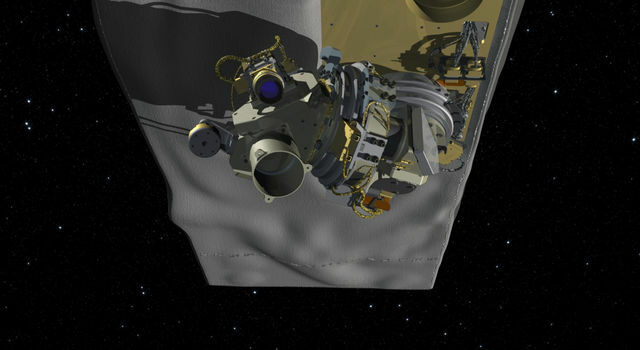 Working in bitter cold, slushy, windy conditions (minus 10 degrees Celsius, or 14 degrees Fahrenheit), the scientists deployed the probe in two locations of the moulin. Once the probe descended to 110 meters (361 feet), it encountered horizontally flowing water and debris about one to two meters (3.3 to 6.6 feet) deep. In this particular moulin, the water flows out in well-developed channels to the edge of the ice sheet. At the time of the experiment, the scientists measured the water flow rate of the surface melt rivers feeding the moulin at approximately 15 cubic meters a second (about 238,000 gallons a minute). 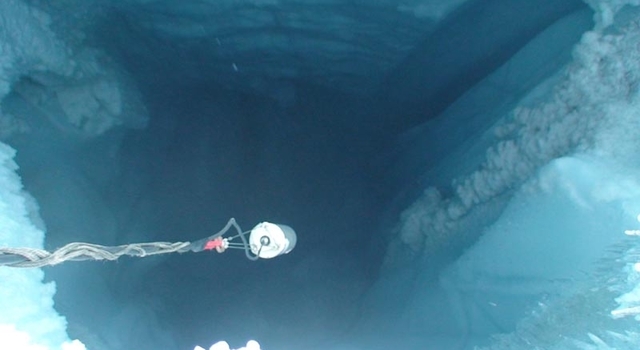 Video data from the probe revealed enormous ice caverns formed by the moulin deep beneath the glacial surface. This particular moulin appears to fill up with snow, which hardens during the winter. When the surface melts in the summer, this ice forms snow bridges. Behar believes the probe reached the bottom of the moulin. Next year, University of Colorado scientists will use ground-penetrating radar to accurately measure the glacial ice thickness at this location. 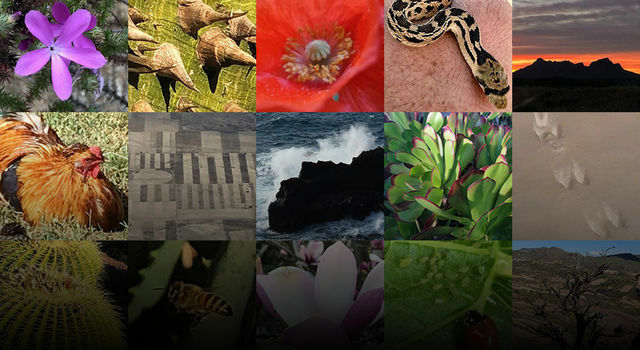 These data will help scientists better interpret their findings and plan future tests. The probe's design will be reevaluated this fall and modified, if necessary, in preparation for future tests. Detailed results of the investigation will be presented at the December meeting of the American Geophysical Union in San Francisco. 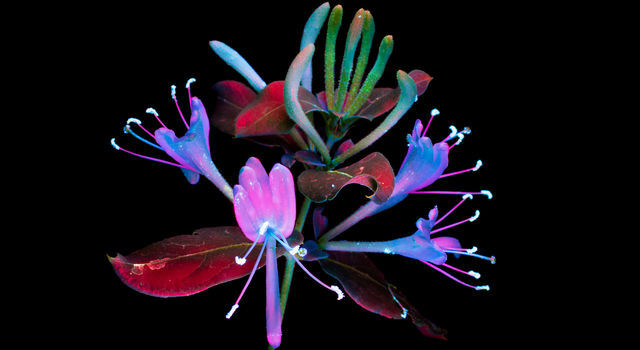 The research was funded by NASA and the National Science Foundation.